In my skincare post, I mentioned that I was looking for a new moisturizer and just in the last week, I found something that suited my needs. Originally I was looking for a gel-like moisturizer but this one caught my eye while browsing in the skincare aisle. 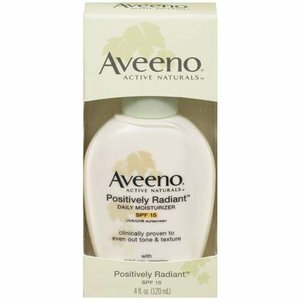 Well actually, the Aveeno Positively Radiant Daily Moisturizer caught my attention but at a price tag of $14.97, it stayed on the shelf. I couldn't bring myself to spend that much on a moisturizer so there it stayed. But the alternative to that was the Equate Naturally Beaming Daily Moisturizer that was only $4.97-- a whole $10 buck cheaper, which was right up my alley. Wal-mart is notorious for doing this. They usually offer a "knock-off" version of the more popular products. It even said so in the packaging, stating that it was comparable to the original. It states that "helps even out skin tone and texture," which is what the Aveeno line similarly promises. Also, like the Aveeno, the Equate moisturizer contained SPF 15. And it comes in a pump. Typically, I'm not a fan of SPF lotions because of the cast they give on my skin if not rubbed in extremely well. And any thing with SPF tends to have an unpleasant smell that I'm found of at all. Without fail, the two aforementioned issues arose. With good blending I was able to make the white cast disappear Now as for the smell, Equate tried to mask it with a fragrance but it wasn't enough because I could still smell the SPF-y lotion smell. Yes, it wasn't as prominent as it would be in other lotions but it was still there. Another thing that I noticed was the fact that it came in a pump. That convenience factor in comparison to my usual moisturizer was a pleasant change. My current moisturizer comes in jar and dipping my hands in there is both not sanitary and I can't necessarily get control as to exactly how much I want to take out. With this new moisturizer, one pump is enough to cover me and my neck area. Even though the issues of the SPF was there, it gets the job done and I can't really complain about it. We all need SPF especially during this time of the year. In fact the SPF may be a little too low but I'm not outside a lot so I'm not too concerned. I jut appreciate the benefits of the products along with its protection against the sun. Are there any moisturizers that you like? Hate? Want to try? Are there ones you prefer if you have oily skin? Dry skin? Share some of your thoughts. Is this moisturizer oil-free? Thanks!